The latest development in the area of medical technology and telemonitoring has been the smart-phone electrocardiogram. 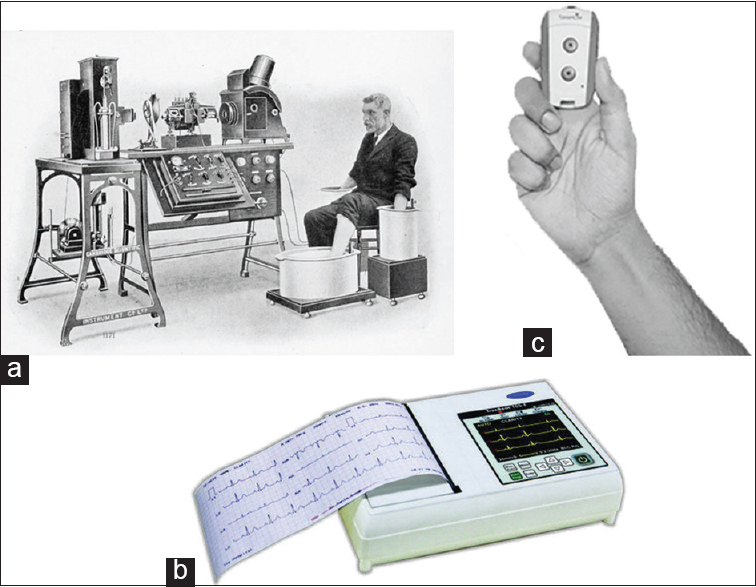 The wide availability of smart phones in India, makes it a potential handheld ECG machine. ECG is highly used investigation in cardiology, with its ability to pick up Acute coronary and arrhythmic events. In this article, we would discuss about two such devices SANKET life, which is made in India and the US FDA approved Kardia ALive Cor device. After the introduction of immunosuppressive drugs in the management of postheart transplant patients, the incidence of rejection has decreased significantly resulted in improvement in mortality and long-term outcome. Induction regimens provide intense early postoperative immune suppression while maintenance regimens are used throughout the patient's life to prevent both acute and chronic rejection. An immunosuppressive regimen tailored individually for each patient will help in decreasing the incidence of adverse events and complications. A complete understanding of currently available immunosuppressive agents is therefore essential. Cardiac amyloidosis is characterized by clinically significant extracellular amyloid infiltration of the heart that is commonly associated with multiorgan involvement depending on the type of amyloid. The deposits are derived from one of several amyloidogenic precursor proteins, and the prognosis of the disease is determined both by the organ(s) involved and the type of amyloid. Cardiac involvement represents the most important prognostic factor and thus an early diagnosis of amyloid heart disease is of utmost importance influencing further prognosis and management of the patients. The last decade has seen considerable progress in the understanding of amyloidosis. This review broadly aims to discuss clinical manifestations and diagnostics of amyloidosis with the main focus on treatment of amyloid cardiomyopathy. The Cardiovascular Research Convergence 2018 was held at International Centre for Genetic Engineering and Biotechnology and All India Institute of Medical Sciences on October 13 and 14, 2018. The program highlights were interactive sessions between clinical and basic scientists and case-based learning on cases of Eisenmenger syndrome, familial heart failure, and young patients with myocardial infarction. 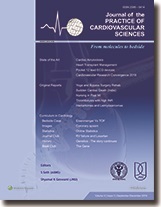 Some of the best research presentations included papers on vitamin deficiency in rats, cytochrome b5 reductase 3 as target to counter hypertension, high throughput screening for molecules for antihypertensive compounds in plants, Dhadkan: A smartphone app for heart failure (HF) patients, genetic variants in association with coronary artery disease in India, biomarkers after mitral interventions, the Indian experience with angiotensin receptor neprilysin inhibitor, and the AIIMS yoga program Kardiac Rehabilitation Yoga Trial in patients with HF. A program for training nurses in HF management was also conducted. Organ donation is one of the greatest medical marvels of the twentieth century which has saved the lives of several patients. The disparity between the huge demands for the organs and their poor supply is the main issue. The total organ donation shortage in our country can be met even if only few victims involved in fatal accidents serve as organ donors. Organ donation and successful retrieval of life saving organs is a complex process involving co-ordination of multiple transplant teams. This article reviews the different kinds of organ donors, evolution and present status of organ donation program in India, legal aspects of organ donation, process of pledging organs by a living person and the efforts taken to promote awareness about organ donation. Primary cardiac neoplasms are rare with an estimated prevalence of 0.001%–0.2%. Cardiac tumors are mostly benign and myxomas are the commonest. Malignant tumors are rare in which metastasis and infiltration from the adjacent malignant tumor is more common than the primary ones. Amongst the primary malignant tumors sarcomas are the commonest. Primary epithelioid leiomyosarcoma of the heart is extremely rare. 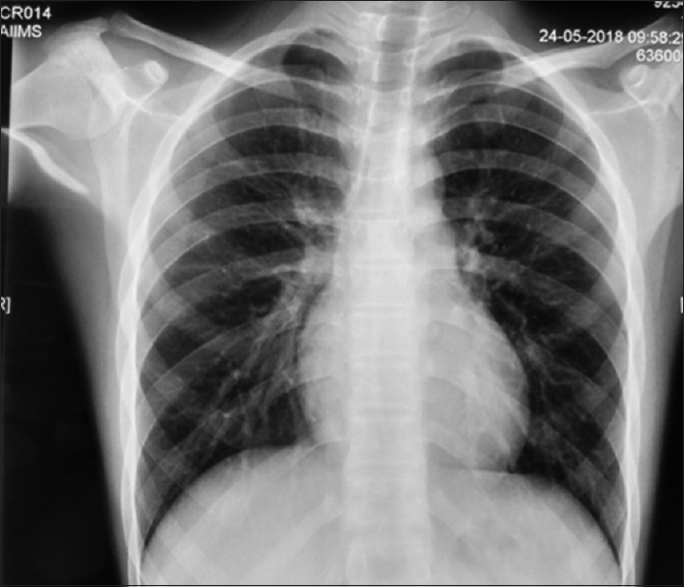 Here, we present a case of a 67-year-old female patient who was admitted with acute onset of pulmonary edema; on investigation, the patient was found to have left atrial mass. A provisional diagnosis of large left atrial myxoma with left ventricular inflow obstruction was made. Biopsy taken showed features of leiomyosarcoma which was confirmed by immunohistochemistry. Most of the patients with cardiac sarcoma have a high-grade tumor at the time of diagnosis with distant metastasis in the lungs (35.7%), lymph node (14.2%) followed by liver (7.14%) and they potent a poor prognosis. At present, only a few hundred primary cardiac sarcomas have been reported, most of which are based on autopsy series. Primary cardiac epithelioid leiomyosarcoma is a rare entity that can pose a diagnostic dilemma. However, atypical presentation of “atrial myxoma” being the common differential diagnosis. Histopathological evaluation is confirmatory to diagnose such a lesion. The pathologist should be aware of such an entity which can be attended by morphological evaluation including immunohistochemistry. Background and Objectives: Pain associated with injection is a root of great anxiety and distress and incite severe fear, which may lead to treatment noncompliance. The present study aimed to assess the effect of vibratory stimulation on pain perception after intramuscular (IM) injection of benzathine penicillin to patients having rheumatic heart disease (RHD). Methods: Using purposive sampling and cross-over design, 100 RHD patients were randomly assigned to either of the 2 groups. The first group received the first IM injection with vibration therapy, and the second injection, 21 days apart with usual standard practice, while the second group received injection in the reverse order. Subjective and objective pain assessment was done using numerical pain rating scale and biophysiological measures [blood pressure and pulse] respectively. Results: There was a significant decrease in subjective pain score (Mean ± SD) when vibratory stimulation (4.52 ± 1.37, 2.91 ± 1.18 and 1.93 ± 1.09) versus usual standard practice (7.12 ± 1.2, 5.51 ± 1.5, 4.20 ± 1.4) was used (P = 0.0000) at first, second and fifth minute respectively, while no significant change was seen on objective scores. Conclusion: Females, younger and highly educated experienced comparatively more pain. Vibratory stimulation decreased subjective pain perception of patients receiving IM injection of benzathine penicillin, while objective measures did not show significant results. Background: OHCA (out of hospital cardiac arrest) is a leading cause of death in developed countries, outcome of which depends upon various factors. Not much data is available in India, on outcome of OHCA. Thus, this study was conducted to assess various clinical and biochemical parameters in predicting outcome of survivors of out of hospital cardiac arrest. Methods: This prospective study was done in HDHI Unit of DMCH, Ludhiana over a period of 12 months (January, 2016 to December 2016). 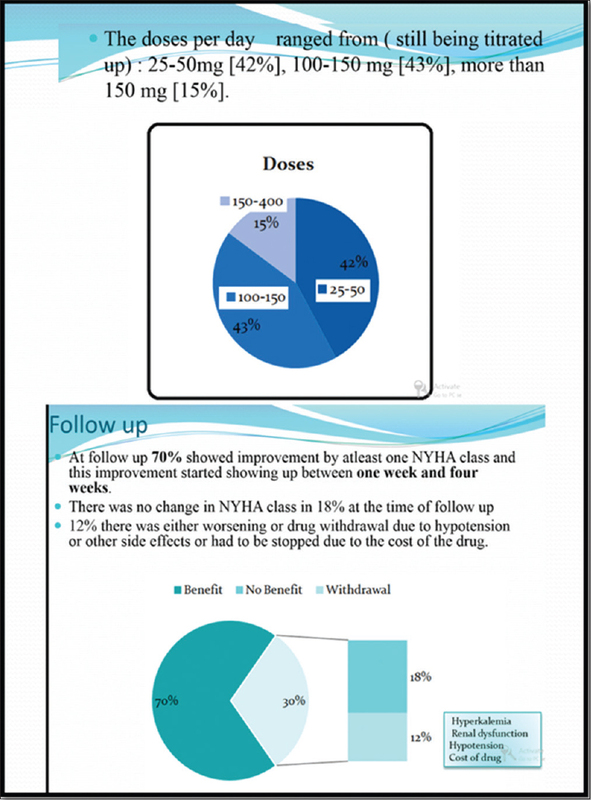 Patients of OHCA who were revived following CPR were enrolled for the study and outcome in terms of GCPS and NYHA was seen after one month. 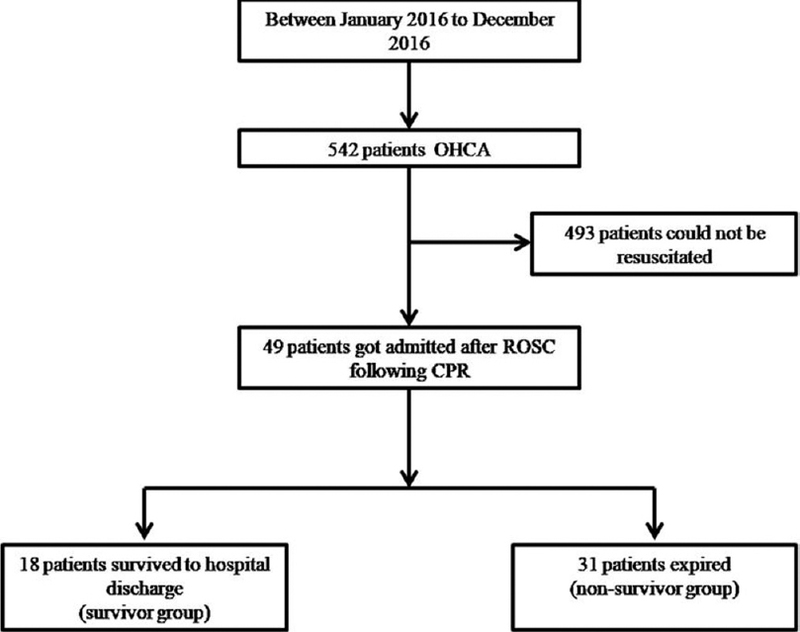 Results: A total of 542 patients of OHCA presented to the emergency, of which 49 (9.04%) patients were admitted after ROSC following CPR. Of these 49 patients, 18 (36.73%) survived to hospital discharge and 31 (63.26%) expired or took discharge in a critical condition and presumed to be expired. Mean age of patients was 58.06 ± 15.1 years and males constituted 67.35%. Mean time from arrest to hospital was 7.44 ± 6.9 minutes (survivors) compared to 13.23 ± 8.1 minutes (non survivors) (P value = 0.009). Mean duration of stay was more among discharged (P = 0.006). Patients presenting with VF/VT (P = 0.003) as first monitored rhythm compared to asystole (P = 0.004) had better outcome. On multivariate analysis VF, duration of hospital stay, raised urea and creatinine, time from arrest to first help and hospital were predictors of good outcome. Conclusion: Shorter time interval from arrest to reaching the hospital and shockable rhythm were associated with better outcome in patients of OHCA. Duration of CPR (cardiopulmonary resuscitation), age, gender, comorbidities, witnessed arrest and resuscitation attempt by bystander (bystander CPR) did not show any relation in predicting outcome in out of hospital cardiac arrest survivors. Raised urea and creatinine (correctable biochemical parameters) played a significant role in survival was cardiac arrest on way to hospital. Introduction: Nurse-led clinics are a model of care indicated where there are service gaps due to high demand or workforce shortages. 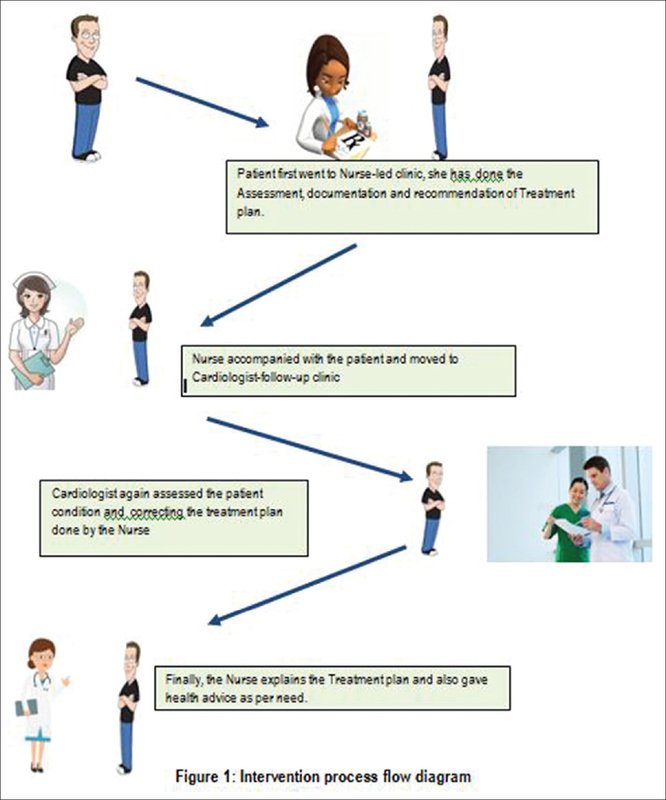 Objective: The objective of this study was to evaluate the feasibility of a nurse-led follow-up clinic among postmyocardial infarction (MI) patients by inter-rater agreement of selected clinical variables with cardiologist clinic and to assess the satisfaction among post-MI patients related to assessment and recommendations done in a nurse-led follow-up clinic. Materials and Methods: Quasi-experimental evaluation design – only posttest using a comparison group was used. Convenience sampling was done. From three follow-up clinics, 79 participants were included, and the interventions were post-MI patients' assessment, documentation, and recommendations, which were done in both nurse-led and cardiologist follow-up clinics using post-MI clinical pro forma. Results: The overall inter-rater agreement ranges from 87.34% to 99.8%. The kappa score obtained was found to be highly significant (P = 0.0001). 86% of patients were highly satisfied and only 14% were moderately satisfied, and the total mean score was 34.47 ± 6.15. Conclusion: The nurse-led clinic was feasible among post-MI patients after proper training of nurse. Background: Pranayama is a science of breathing which involves prolongation and control of breath. It is known through various studies that yogic practices improve respiratory and cardiovascular function, reduce stress, anxiety and enhance overall well-being and quality of life. However, hemodynamic effects of short term yoga are not well known. Objective: To study the acute hemodynamic effects of pranayama in stable post coronary artery bypass grafting (CABG) patients. Study Design: Case control study. 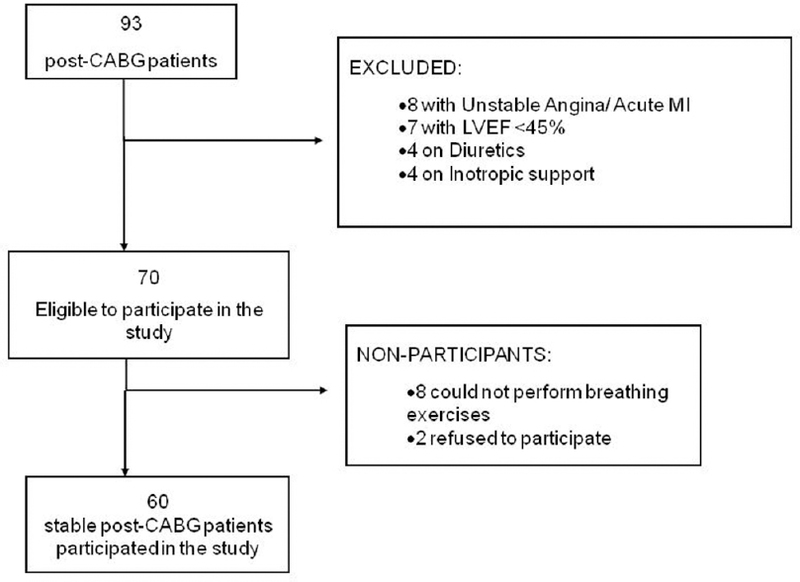 Methods: 60 post CABG patients were divided into - a) study group and b) control group (30 patients each). Cardiorespiratory parameters were noted in control group without pranayama and in study group, 5, 10, 15, 20 and 30 minutes after pranayama. Results were analyzed statistically. Results: There was a reduction in systolic blood pressure (126.10 ± 14.54 to 118.67 ± 13.74; p&lt;0.05), diastolic blood pressure (63.1 ± 10.08 to 58.5 ± 8.1; p&lt;0.05), respiratory rate (27.4 ± 5.1 to 22.7 ± 3.5; p&lt;0.05) and systemic vascular resistance (1164.2 ± 189.8 to 1056.4 ± 153.2; p&lt;0.05) after short term pranayama in the intervention group. The reduction was statistically significant when compared to control group. The heart rate, peripheral capillary oxygen saturation, cardiac output, cardiac index and pulmonary vascular resistance also changed but the change was not statistically significant in comparison to control group. Conclusion: Pranayama leads to decrease in systolic blood pressure, diastolic blood pressure, respiratory rate and systemic vascular resistance. 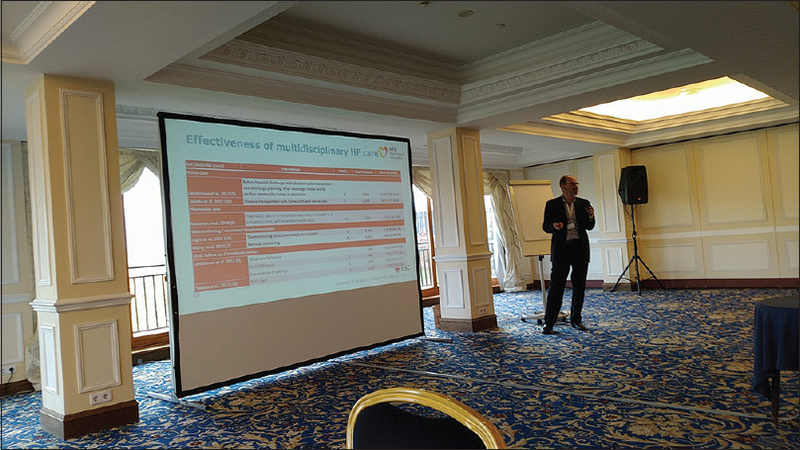 Introduction: The patient care workshop was organized by the heart failure (HF) association of the European Society of Cardiology (ESC) in Vilnius, Lithuania on October 26, 2018. Cardiologists, general practitioners, and nurses from nine countries were invited to the workshop. Background: HF is a complex clinical syndrome that requires a complex treatment regimen and is associated with frequent hospitalizations, poor quality of life, high morbidity and mortality. The practice of evidence-based guidelines of HF will help for continued professional development among cardiologists, practitioners, and nurses who manage HF. Program: The workshop was divided into five sessions. The sessions were focused on the following topics: (1) ESC newer guideline for diagnosis, including the BNP and echocardiography, On-going management with drug optimization and advanced therapies-ICD/CRTD/LVADs, (2) the specialist HF programs and its curriculum, (3) the importance of setting up centers with specialized experts in treating HF patients and the importance of a multidisciplinary approach to managing HF, (4) components of a HF program, (5) HF patient's health education, (6) self-care management, (7) medication adherence, (8) discharge counseling, (9) discharge planning of patient with comorbidities, (10) different approaches of home-based management at “community level” and “home visits,” (11) The role of the cardiologist, General practitioner, and Nurses within the HF team, (12) The specialized HF nurse curriculum, and (13) practical considerations for setting up an HF specialized service- money, personnel, room, specialized curriculum for training the personnel, supporting agencies, and network around the globe. Conclusion: Educational programs for cardiologists, general practitioners, and nurses may benefit HF patients and may lead to increased adherence to the clinical guidelines related to selection and optimization of drugs, proper use of advanced device therapies, setting of HF clinics, and thereby increase the patient's health-care utilization. In India, more specialized centers for treating heart failure need to be created and the nurse led heart failure clinics must be developed in larger scale for the better care of heart failure patients. There are many websites which can be used for routine statistical calculations without going to a statistician. In this article, we refer to one such website and also show how to perform a Chi-square test. 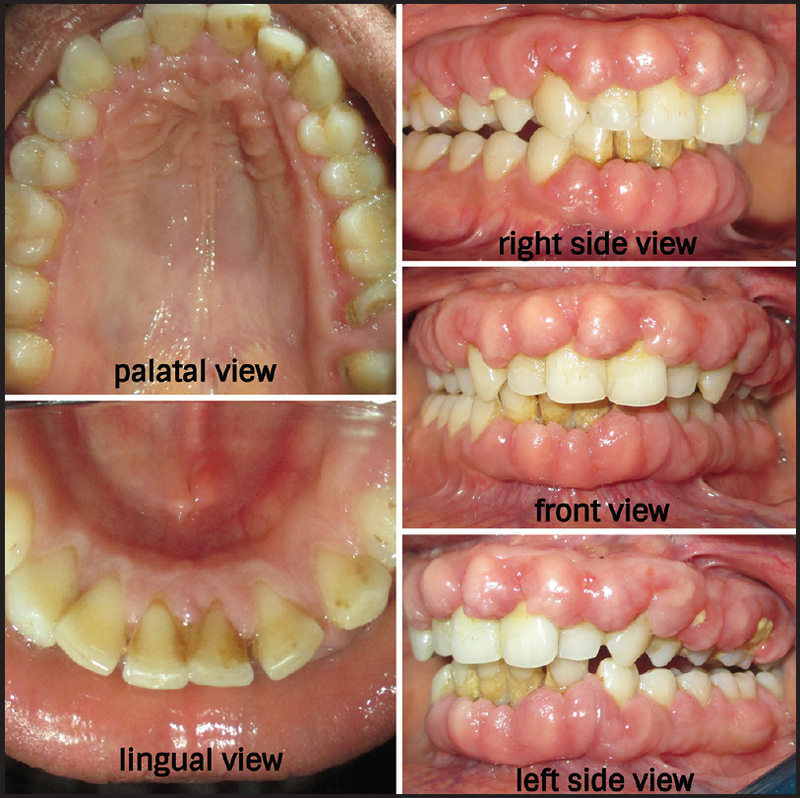 A young boy presented with cyanosis and shortness of breath since childhood. Clinically, he has a single second sound, a quiet precordium, and no murmurs. Further investigations reveal a ventricular septal defect and Eisenmenger syndrome. The steps of clinical evaluation from history to examination and investigations are discussed. The management given and potential complications and their management are discussed. Living beings are encoded with the genes as a hereditary material and genetics deal with the functional and structural study of these genes. Since its discovery by Mendel, still we are struggling to completely elucidate the world, the gene, and its interactions. From pea plant experiments to human genome, numbers of eminent scientists had given their contributions in understanding the vast galaxy of genetic nodes in the genome. With the DNA technology advancement, in the near future, we may able to understand molecular mechanisms of human body leading to customized medicines termed as personalized medicine. In this article, we had taken further the story of gene part I to extend our acquaintance before human genetics. We had also given special context to Indian scientist making remarkable achievement in the field of genetics and genomics. Calcification of left atrium is often associated with rheumatic valvular heart disease. It has been described mostly in cases with long standing mitral stenosis and also in patients with mitral valve replacement. It should be suspected in patients with rheumatic heart disease with severe mitral stenosis or post mitral valve replacement who present with features of severe PAH and right heart failure in the presence of a normal functioning prosthetic mitral valve. 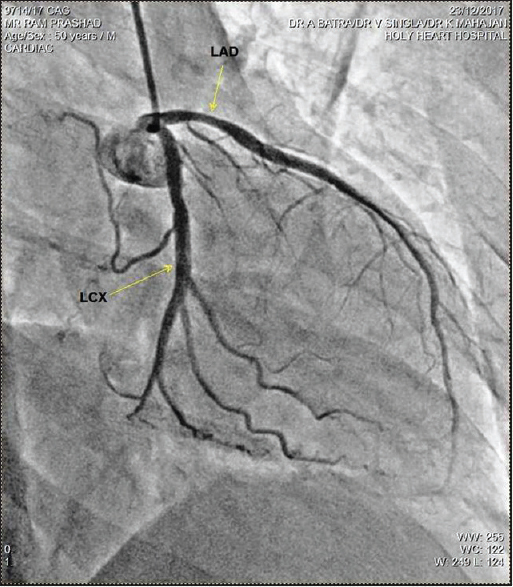 Here we report a 57-year-old man who had underwent closed mitral commissurotomy about 30 years ago and mitral valve replacement about 18 years ago and now presenting with left atrial calcification. This literature also discusses the management options available. Appropriate guidelines are not available at present for the management of patient with acute prosthetic heart valve thrombosis presenting with New York Heart Association Class IV symptoms and having deranged coagulation profile. 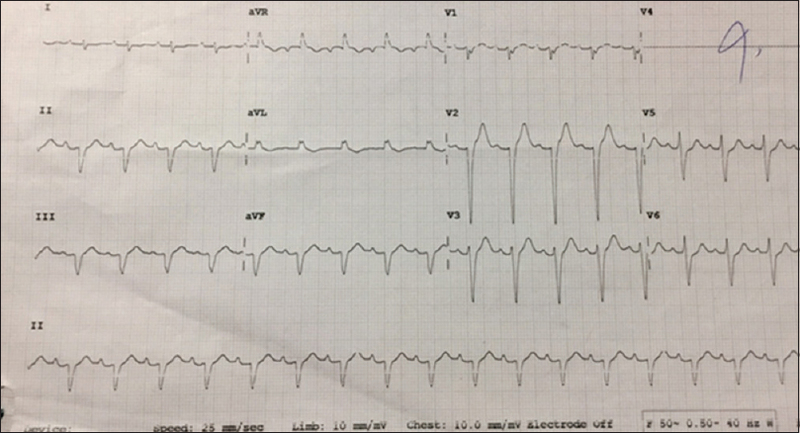 Here, we thrombolyzed one such patient with tissue plasminogen activator (alteplase) using very slow infusion (25 mg over 24 h) which resulted in rapid improvement in symptoms and subsequent resolution of pulmonary edema with simultaneous improvement of echocardiographic gradient and fluoroscopic movement of leaflets. Temporary epicardial pacing wires are routinely used after open-heart surgery without any major complications, but varied complications have been described with their use though rare. They are often pulled out after recovery of the patient, usually on the 4th postoperative day, but sometimes, they are cut flush with the skin, especially if they are not coming out after the usual amount of pulling force. We describe a patient who had recurrent sternal sinuses with retained pacing wires which were missed on imaging. We emphasize on the importance of proper fixing of epicardial pacing wires during cardiac surgery, the need for their complete removal after recovery and the need of documenting the same in discharge summaries if they are cut flush and retained in situ. 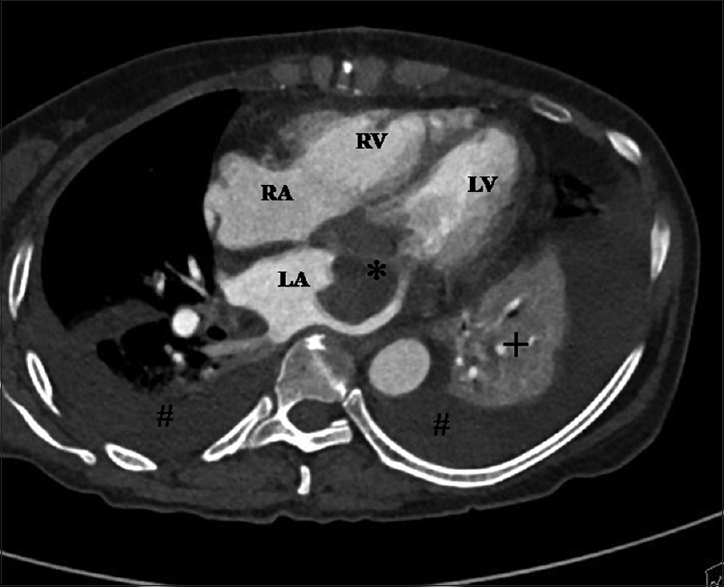 An anomalous pulmonary venous and systemic connection associated with a partial atrioventricular septal defect (AVSD) is rare. 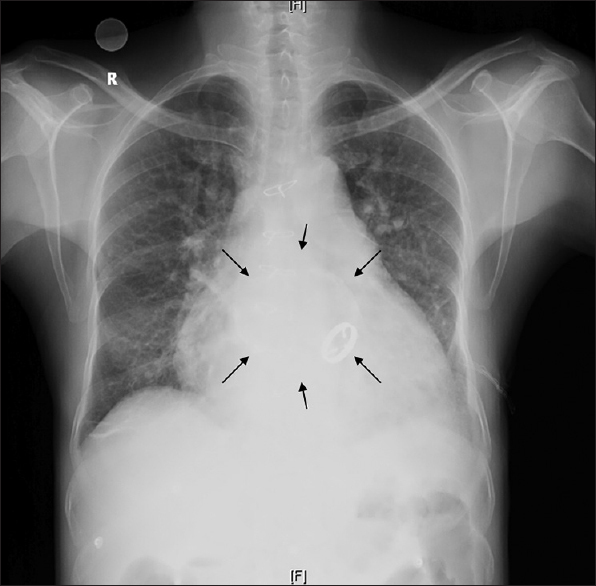 A 23-year-old patient, who presented with dyspnea and cyanosis on exertion, was found to have an anomalous pulmonary and systemic venous drainage with separate drainage of the left superior caval vein and hepatic veins into the left atrium and a partial AVSD. 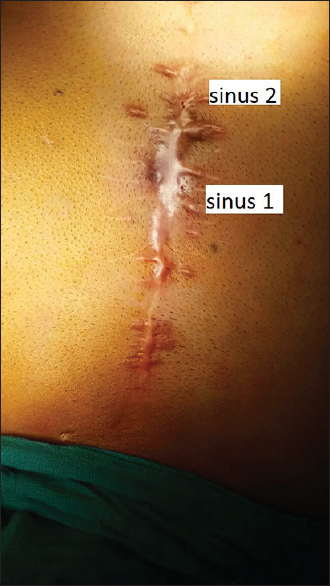 A patch diversion was successfully performed using two patches of glutaraldehyde-treated pericardium to create a nonobstructive pulmonary and systemic venous drainage.